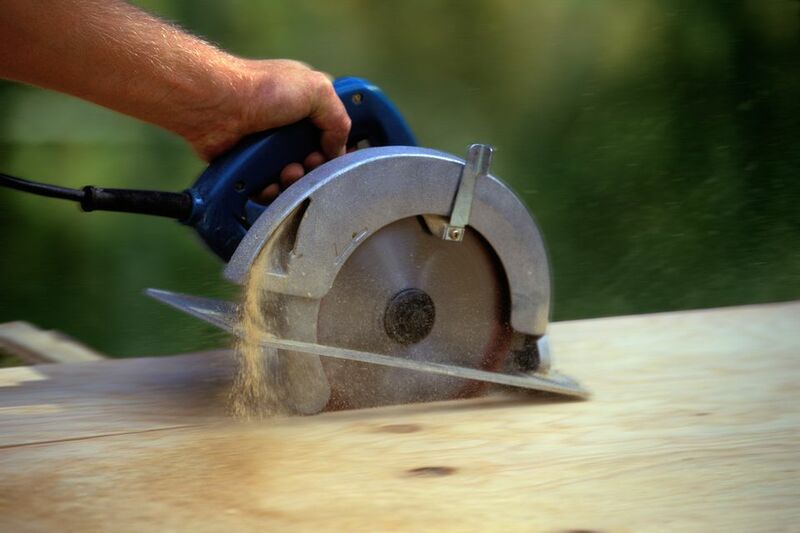 A woodworker may choose to employ a circular saw for the same reasons that carpenters and building contractors have used them for years: they are powerful, portable, able to be set up to rip, crosscut and cut many non-wood materials. Here, we'll discuss the features you should look for when choosing a circular saw. Circular saws come in a few different sizes (based on the diameter of the saw blade), from 4" up to the most common size, 7-1/4". They also are typically rated by horsepower and/or RPMs of the saw blade. When choosing a circular saw, a good rule of thumb is to buy one that has higher horsepower than other models of the same size. While a 1-HP 7-1/4" circular saw would probably be adequate, we like models that are at least two horsepower, as they are less likely to bind when under a load. Circular Saws have controls for adjusting the depth of the cut (from zero to about 2-3/8" on a typical 7-1/4" model) and the bevel of the cut (the saw blade can be beveled from zero to 45-degrees). Check to see that these controls are easy to adjust and can be firmly tightened to hold the depth or angle. Some models use relatively large, lever-type controls where others employ little more than a wingnut. Circular Saws all have some basic safety features. Check to see that the saw you're considering has a safety switch, which must be held before the trigger can be depressed. There should also be a blade guard that moves easily when pushing the saw through wood, but springs back into place when the saw is away from the stock. As with all tools, circular saws can be very dangerous if not used properly. Always read, understand and follow the safety instructions that come with the saw. Better quality saws employ additional features such as an anti-locking clutch, which are flanges on either side of the blade that will allow the blade to slip if the blade binds on the stock, to protect the motor and drive mechanism. Another useful feature is a blade lock, which locks the drive spindle in place, making it easier to change the saw blade. A recent advancement in circular saws is battery operated, 4-inch blade models. These are wonderful for small cutting operations, such as paneling or 1/4-inch plywood. They're lightweight and perfect when you need to reach high to make a cut. However, they're lacking in horsepower, and aren't much use for cutting more than a just a few 2x4s. We would definitely recommend having one of these battery-operated units on hand, but not until you have a number of other tools in your arsenal.